NORTH WEST BAY SHIPS "E-MOTION"
The Australian yard North West Bay Ships is known for building fast commercial crafts, but with "E-Motion" it makes its debut in the world of megayachts and this is done by immediately setting a record: "E-motion" is the first pleasure trimaran of this size ever built. As for the yard, this is the second vessel of this type and size built on the yard's premises, the first one was launched four years ago and still sails in the Sea of Japan carrying 450 passengers at 40 knots, even in rough sea conditions. Classification: DNV+, 1°1, LC, Yacht, E0. For further information contact: North West Bay Ships; 83 Gemella Rd; Margate Tasmania; 7054 Australia; tel. 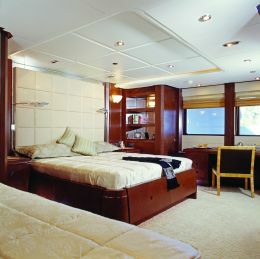 +61 3 62670101; fax +61 3 62670102; e-mail: info@yachts.nwbs.com.au; website: www.yachts.nwbs.com.au. It is from this first model that the shipyard's managing directors understood that the wide beam and the trimaran hull were features that could be applied to the world of pleasure yachting. Impressed by the behavior of the trimaran in rough seas, an Owner asked the yard to design a similar yacht for himself. A few months later, the design, building and testing of the new megayacht called "E- Motion" started. The displacement of this original yacht is twice that of the first-born trimaran of the Australian yard and some technical characteristics are different, such as the center of buoyancy and the design of the side hulls. These were designed in such a way as to reduce windage and optimize performance and fuel consumption. During model testing, carried out in the Australian Maritime College, the designers found the most effective waterlines and decided to install underwater engine exhausts without reducing the hydrodynamic efficiency altogether. 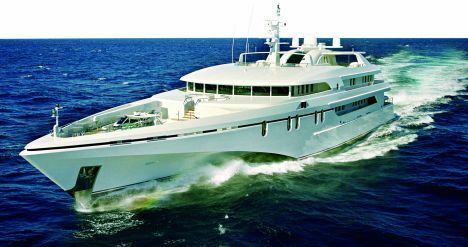 Hulls and superstructures are in aluminum and were designed by Sam Sorgiovanni Designs of Western Australia. The special structures used for decks and hulls allowed the yard to balance weights and to efficiently meet the Owner's requests as for the interior layout. "E-motion" has four decks: the lower one is as wide as the central hull whereas the main and the upper intermediate deck take advantage of the extraordinary width of the platform. The engine room is aft of the main section of the central hull and includes two 2,130 hp 3512BTA Caterpillar engines coupled with ZF 4660 reduction gears and with transmission to two five-blade propellers; the engines must be staggered because the hull is not wide enough. In practice, the port side engine is forward of the starboard side one, requiring a greater and longer shaft to the propeller which is obviously on the same level across as the starboard one. The two propellers are quite forward in order to thrust the flow inside the two big tunnels created by the existing side hulls, which convey the thrust with very little noise and vibration. The asymmetrical installation of the engines allowed for a large and easily accessible engine room that includes all onboard systems (electric power, water purification, etc.). The cabins are arranged on three decks. The lower deck includes the crew quarters with cabins, bathrooms, crew dinette and service rooms. 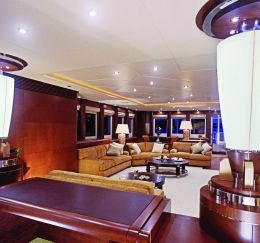 The main deck includes the Owner stateroom, covering the 15.20-meter (50') width of the superstructure. On this same deck, aft, there is a large open-air space with a 1,200-liter (317 gall.) aquarium to exhibit the catch of the day plus an enormous deep-freezer for storing the catch, many shelves for bait preparation, wells for fish cleaning plus a fighting chair. All this fishing gear makes it clear how the Owner is a deep-sea fishing enthusiast: on the upper deck aft there is a fisherman area and in the main deck aft there are two tenders. But let us go back to the interior layout. 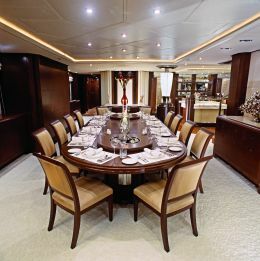 In addition to the master stateroom, the main deck includes a relaxation area to starboard with sofas, armchairs, bar counter, a gaming table and entertainment systems, while to port there are the dining room and the salon with sofas and coffee tables. The two areas are separated by a central structure over which lays the stairway connecting this deck to the first upper one. All guest cabins are on this upper intermediate deck, together with the captain cabin and helm station with direct access to the technical areas. 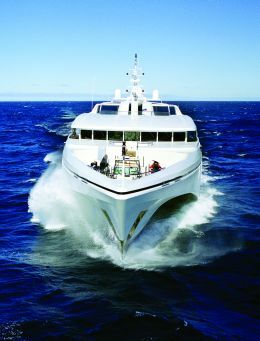 It was thanks to the ample surface of the platform as well as to the exceptional stability of the trimaran hull that the five guest cabins could be fitted on this deck. 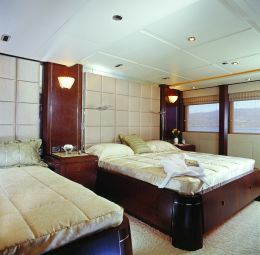 Just one of them is set up as a VIP cabin, but all are very spacious and have a double bed. Two of the guest cabins have an extra single bed. 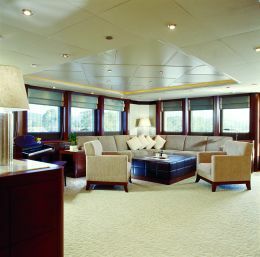 This intermediate upper deck also includes two relaxation areas aft, one to starboard with sofa and dining table and the other one to port with sofas and two coffee tables; these are partially protected by the aft extension of the highest deck which includes two separated sunning areas and an additional relaxation area aft with tables and armchairs. Amidships, there is a central enclosed lounge offering panoramic views even in bad weather conditions or when the yacht is under sail, thanks to the raised position of this deck. 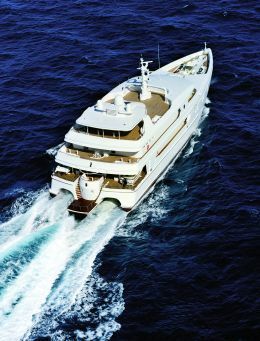 Even though "E-Motion" derives from a commercial ship, it is quite evident that she is a pleasure yacht. The only features that remind us of fast ferries are the shape of the bow and of the stern - with tunnels between the hulls - that we are not used to see in pleasure boats. As it is legitimate to expect, originality is the norm on this North West Bay's yacht: starting from an unusual platform the rest goes without saying. Many are the fittings and accessories available for water sports, such as jet skis, the surprising presence of deep-sea fishing gear, a tender for towing water skiers. In short, whatever we can think of for guaranteed amusement during a cruise. The extensive areas and their layout, developed by the architects according to the original Owner's indications, offer privacy and comfort to the guests.